Why Is Painting Kitchen Cabinets So Popular in the Bay Area? Kitchens are enjoying more popularity than possibly ever before in the history of cooking spaces. Well, more and more homeowners like you are taking advantage of the unique blend of style and function that they offer; it’s a place to make dinner, but it’s also a place to showcase your preferred tastes, textures, colors, and designs. From backsplashes to countertops, sinks to fixtures, wall color to lighting, your kitchen holds nearly limitless potential. With that in mind, any kitchen updating or design strategies that offer quick results and a major impact naturally get a lot of attention. And, when it comes to powerful ways to update your kitchen, cabinet painting reigns supreme. What Kind of Transformation Does Cabinet Painting Offer? Painting or Finishing New Cabinetry - Whether you’ve just built your home or remodeled your kitchen, unfinished cabinetry offers a clean canvas to work with. Refinishing Existing Cabinetry - If you love the existing paint or stain but it has grown tired over the years, you may just need a refreshed finish to bring back that original beauty. Painting or Refinishing with New Hardware - You would be amazed by what a difference fresh stain or paint combined with new hardware can make. Cost-Effective - In comparison to a complete replacement, painting your cabinetry is much less expensive. 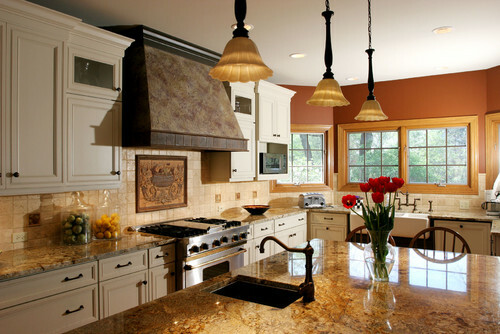 Less Intrusive - The kitchen is one of the most important rooms in your home. Making an update without needing to completely tear the space apart is always a benefit. Faster Process - Going hand in hand with our second point, painting and refinishing is a faster process than completely replacing cabinetry. Your kitchen can be up and running (and looking better than ever) in a relatively short amount of time. Bonus Benefit: Paint and stain not only adds another level of beauty and style to your surfaces, but also an essential layer of protection. Keeping this protective barrier at full strength is a direct investment in the lifespan of your cabinets. What's Trending in the World of Cabinet Paint Colors? As we discussed above, the beauty (literally) of painting kitchen cabinets is that you have total control over the style in this important space. The huge amount of variety living under the umbrella of "popular colors," ranging from deep black to shabby chic, is evidence that homeowners today are loving this stylistic freedom. 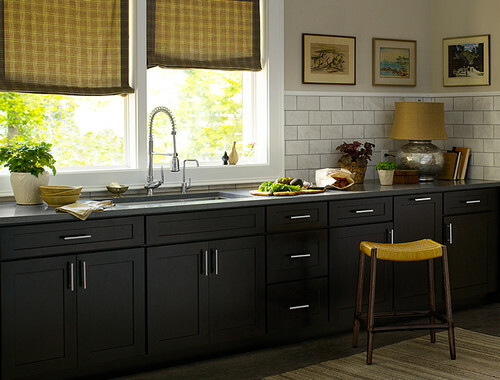 Here are a few examples from Houzz.com (a wonderful source of inspiration for home improvement projects!). 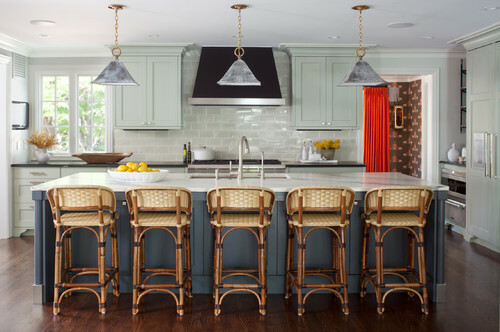 As you can see in the picture above, it's also popular to paint your kitchen island a complementary color. This creates a nice visual contrast, and it also transforms your island into an accent piece rather than tying it directly to your cabinets. If you are looking for a timeless color that is as popular today as ever, we would point you in the direction of white. From soft and clean to warm and buttery, there is plenty of subtle variety to choose from to fit your specific space. The featured photo above is a stunning kitchen we painted for one of our clients, and it offers a perfect example of how beautiful white cabinetry can be. Our final tip is to find a painting professional you can trust and feel comfortable working with. Painting is a personal process, and having expert input when it comes to colors, finishes, and style ideas can be invaluable. After all, the end goal is for you to have a kitchen that you fall in love with all over again. If you live in the San Francisco, East Bay or Contra Costa area, we hope you will contact us at MB Jessee. It would be our pleasure to serve you!